I am looking for an action/helmet camera so i will be able to document my rides. waterproof (for riding in heavy rain). Does anyone have any camera model to recommend? I have an HD170 Stealth. Yeah it cost me about 180 quid but it's a pretty good piece of kit, but it doesn't delete stuff when full up. If you're looking for £100 then your best bet is second hand. Search my username on youtube to see what it's like. Plugging my content wheeee! I hear bullet cameras are the way to go if you just want fuss free recording. You can wire them into your bike to start when you turn the bike on etc. I use a go pro hero 2 and am very pleased with the results. I have a 12v socket and a charger with a couple of spare batteries. Easy to use with a bit of practice. Mmmmm I'm not sure I would want a kiddy's harness, but I might be interested in an eye patch. On Techmoan's website, he thinks the best cam you can get for around £100 is the TCL SCV200. If you're not aware Techmoan does a lot of sport camera reviews and he has over 40,000 subscribers on YouTube. I had this exact camera for 3 days!!! on the third day I took it out of its waterproof housing (as i left it on the bike), and then I managed to drop it while walking from the bike to the office (about 30 meters), but it fell on the the lens. 3 days...and I have a broken £110 camera. Get a camera that you can use an external microphone, as you can then move it out of the wind. Hey guys, thanks for the update. I ended up buying the new Drift Ghost-S. I must admit that from using the camera last night for the first time there is no comparison to the SVC-200. its on a different league. I drove in the evening (7PM) -M25 and M4. the camera was on mounted to my handlebar using my old/new/broken SVC-200 mount. it mounted perfectly. no shakes, perfect video, and I used external mic which made the sound quiet. I will upload a clip soon. Let me know what you think. 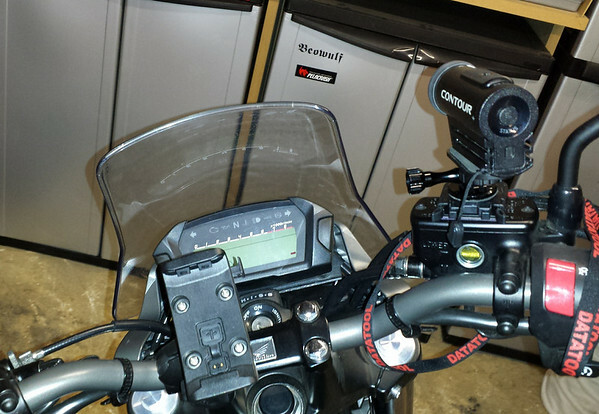 Now I am searching for a video on how to mount the drift to shoei neotec (let me know if you find any). Lucky man, i would like one of those for my trip abroad in June. The feature where you can only save the last few minutes when pressing the remote is a huge space saver for the memory card and ideal for a long trip. True, but there are some downsides to it as well. I think that a lot of the times if something happens, you forget to press the button, and then you missed it (even though it can record up to 10 mins before, 10 during , 10 mins after (30 mins all together), if you had an accident or something like that, you might forget to press the button. I must admit , I am very excited! My favorite is Contour+ / Contour+ 2. It comes with a waterproof case (up to 60m ! ) and has a lot of mounting solutions, ext. microphone jack & GPS. I don't believe that you'll find an action camera with this 'car' mode. And IMHO it's silly. You may lost a very nice or important moment! Also I wouldn't recommend 1080p. 720p @ 50 fps is descent enough even on an 1080p display and smooth (25 fps are not enough for motorcycle speeds) and it needs less storage capacity than 1080p, and it's easier to edit on a computer. And lastly, If you want to check the quality of a camera's quality don't look at YouTube. It drops quality in favor of small video sizes. I have a Contour Roam2 and prefer to use it at 1080 30 fps then 720 60 fps as you can clearly see the difference in quality. It runs smooth enough and I can still capture blur free pictures from the movie when I want to grab a frame. I have used 720 60 fps a few times when I wanted to slow down the movie. The Contour 2 was definitely only my list when I started looking for action cameras. it was actually at the top of my list initially, but sadly I have been told that its low light / night / UK winter weather is not the best to say the least. So i had to turn away and keep on searching. Maybe in the future (when they come back from administration) they will come up with a new version which is good for low light. Also, the Contour 2 plus is not longer waterproof, and they recommend using the underwater housing for rain etc - which is kind of missing the point (the contour was 1 Meter waterproof without the external housing. The Drift Ghost-S has the Car mode option! you have a couple of options with Car mode. one for auto (stop/starts when car is switched on/off), other option is manual which will start recording when you hit the record button. it will record until the end of SD card, and when full will loop and start from the first file again until you will press the record button again. When you are using the car mode, you can set the segments to be 1/3/5 mins long. So yes, you're right about the size. Since I like to grab pics from my video I prefer the 1080 setting even if it is no so wide. Images are better quality then at the 720 setting and less distortion too. where do you mount your camera? do you mount it on your helmet? or roll bar? Does the helmet base mount prevent from placing your helmet in the fake tank helmet thingy? That all depends on the helmet and what mount you use. With the Contour I have the option to use a very slim mount. What helmet do you have?